Alumnus Kim Alford went along to the event. This is his account. To begin, we were shown footage from 14 July 2015, of an emotional and proud Alice confirming that the New Horizons team had successfully locked telemetry with their spacecraft on its final approach to Pluto. What the video did not show however, was that only a few days earlier on 4 July, the New Horizons team had lost contact with the spacecraft. This ‘anomaly’ as Alice put it, formed the basis of discussion for the afternoon, so we will take a step back to summarise what events led to this moment, and what was learnt along the way. Alice’s journey through space begins in the 1960s, when she was in grade 4. For her science class, she had written a report on the solar system, providing a brief description of each planet. At the end of this report we find Pluto – “mysterious, grey rock”. At the time, that was all that was known of Pluto. Powerful telescopes like the Hubble Space Telescope were decades away, and the Apollo 11 mission to the moon was still a few years away. In telling this story, Alice revealed that her childhood dream was to become an astronaut. Fast-forward now to the start of Alice’s academic career, we find her having just completed her studies in Physics and Chemistry at the University of Virginia, and beginning to carry out research on drug delivery systems. Soon after, she joined the Johns Hopkins Applied Physics Laboratory. Step-by-step she moves closer towards her achieving her dream. Now let me bring us back to just last year on 4 July, when the New Horizons team lost contact with their spacecraft. As one can imagine, losing contact with a spacecraft after a decade of work must be quite stressful. Alice said she panicked for about 20 seconds, and then immediately fell back to her training and protocols, taking charge of the ‘rescue’ mission. This setback was actually one of 13 anomalies, albeit the most serious. 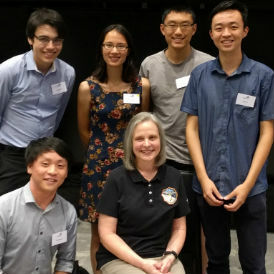 Nevertheless, when attempting to re-establish contact with the spacecraft, Alice still invited the TV crew to film her team because she believes that science is to be shared together by everyone, and failure is just as important as success. Luckily for us, the software fixes were successful, and the spacecraft continued its journey. Just a few days later on 14 July, the spacecraft arrived at its destination, cheered on by many ecstatically emotional scientists and engineers back on Earth. What I found particularly impressive was the accuracy with which the spacecraft’s course was planned. After a total journey time of 9.5 years, the spacecraft arrived 83 seconds early, and only 80km lower than planned (Pluto is 5 billion kilometres away from Earth). When Alice mentioned this, she was met with vigorous applause from the audience, but as she said, “While we were happy with the result, there is always room for improvement”. Perhaps a cliché, but still an important reminder about science and life. Soon after the spacecraft arrived, the first images of Pluto were received by the team. Alice described this as the most satisfying moment of the whole mission. Over a decade’s worth of work, summarised by a single beautiful photo of Pluto. From “mysterious grey rock” to a beautiful reddish-brown planet. Alice said that the amount of activity on Pluto was quite surprising. Its atmosphere is actually quite active, comprised mostly of methane and ice, which glows red as the UV light from the sun interacts with it. On the surface of Pluto we find towering ice mountains. So after a decade of work by the whole New Horizons team, we all celebrate together the beautiful images of Pluto, but the work continues! The New Horizon’s spacecraft travels onwards into the Kuiper Belt, a region of our solar system spanning beyond Neptune’s orbit. On 1 January 2019, the New Horizon’s spacecraft will fly-by 2014 MU69, a Kuiper belt object. In the meantime, it will take approximately 16 months for all the data collected by the probe at Pluto, to be downloaded back on Earth. To finish the session, Alice left us with a beautiful metaphor, that “We are all just like Pluto; our journeys just beginning, and we, just discovered.” And so we say farewell to Pluto as we travel past, but say hello to new discoveries lying in the future!